Lesser Masked Weaver, Range-change map between SABAP1 (1987-1991) and SABAP2 (2007-current). 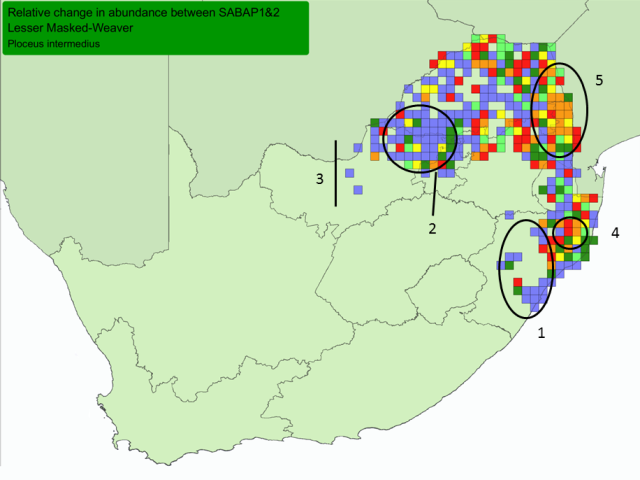 In South Africa the Lesser Masked Weaver has more grid cells with increases in reporting rate than cells showing decreases, between SABAP1 (1987-1991) and SABAP2 (2007-). 1. Greater Durban area, and inland, in KwaZulu-Natal. 3. Western edge of its range in Northwest Province; the souther grid is Barberspan where it has been regularly ringed over the last few years. 4. central Zululand, this decrease may be due to the drought in the region over the last few years. DR Congo: at Kinshasa, out of range (Punga 2015a).